The American DJ Jelly Globe - Tri-LED Sound Activated Light Globe is designed for lighting installations and live performance applications such as for the theater, parties, and clubs. The globe utilizes two Tri-color (RGB) 3-Watt LEDs within a rotating translucent globe to generate 15 sound-activated beams of multi-colored light. The low power LEDs require no duty cycle and are rated to last 50,000 hours. The lights project a 330° beam and can strobe. The variable rotating motor can spin at a maximum of 5 RPM. 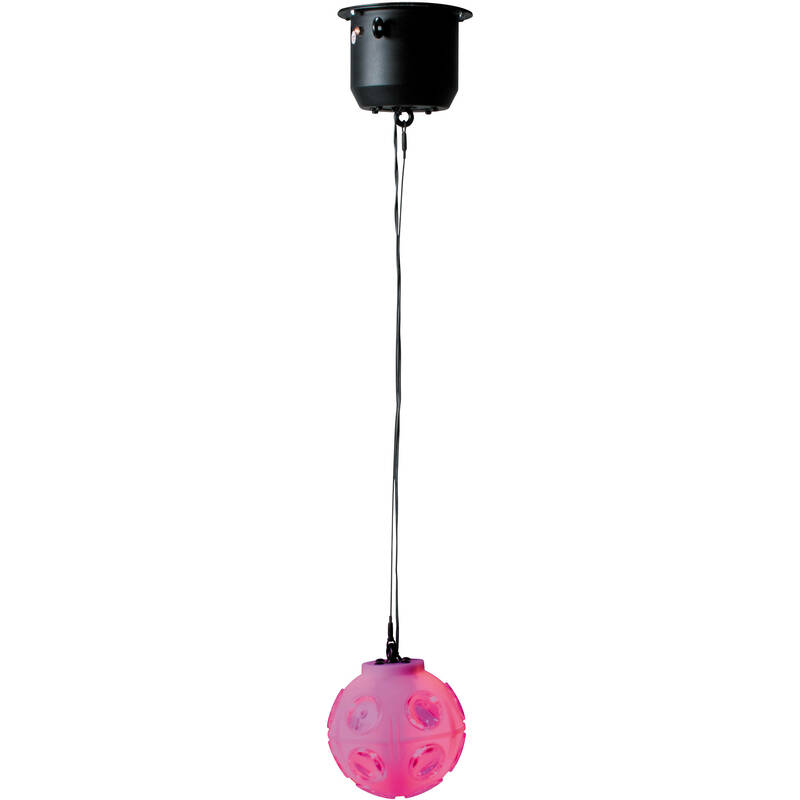 A rear panel built-in safety loop helps secure the globe to your ceiling. Box Dimensions (LxWxH) 13.7 x 7.4 x 7.1"
Jelly Globe - Tri-LED Sound Activated Light Globe is rated 4.5 out of 5 by 2. Rated 5 out of 5 by monojonbrooks from ADJ Jelly Globe does its job well My lady and I are artists and we can appreciate a mirror ball, so when we saw this updated version at a New Year's Eve party in a restaurant, we both were moved. I immediately planned to get one for her later as a birthday gift. It is small and and self lit from within so the outer shell changes colors. It also has beams of light that shine onto the ceiling, walls, and floor. Because it comes with its motorized mountable spinner (already connected as its power source), you don't have to misplace the the motor or the power cable. So pleased was she when I mounted it in her bedroom. Its lights are so great in the room, it has to be talked about. I even got one for my bedroom and another in the living room. If you take it to gigs or photo shoots, make sure you don't let the metal spinner motor touch the plastic globe as to keep the plastic from getting dinged. Rated 4 out of 5 by Zachary from Looks great, but with questionable functionality. Have 2 of these installed over some bowling center settee tables. The globes are bright and colorful, but as far as I can tell, there is no way to control the speed that the ball rotates, and I'm also not even sure that they cue off of sound as advertised. However, at their current price they are still very much worth buying, especially as an upgrade over an old-fashioned disco ball. In fact, I will be purchasing two more.